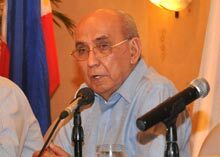 Joaquin Bernas, S.J., a member of the 1986 Constitutional Commission, opened the discussion by exploring the constitutional issues. 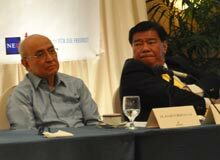 Chief Justice Reynato Puno reaches mandatory retirement on May 17. On the one hand, the constitution bans midnight appointments; hence, the president cannot make any appointments after March 10. The only exception is for temporary appointments to the executive department in cases where this is absolutely necessary. Judicial appointments made by President Ramos in 1998 during the proscribed period had subsequently been struck down. However, the constitution also states that a new chief justice has to be appointed within 90 days. Since the new president will only be inaugurated on June 30, there seems to be some contradiction. Fr. Bernas, S.J., explained that when two provisions seem at variance with each other, the first thing to do is to look for ways to make them both work. That is feasible in this case. After inauguration, the new president would still have 45 days to appoint a new chief justice. This seems sufficient given that the Judicial and Bar Council (JBC) can vet potential candidates now and prepare a list. The next crucial question then is: “does the court need a chief justice right away after Justice Puno retires?” It is possible that the court might have to resolve tricky issues regarding the election results. However, both Fr. Bernas, S.J. 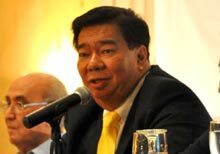 and former Senator Franklin Drilon opined that that was not a serious problem. The Supreme Court has a regular procedure to install the next most senior justice as acting chief justice. There are only few instances where the law mentions the chief justice at all. There seems to be no reason why an acting chief justice cannot perform those roles. In fact when it comes to administering the oath of office of the new president, this could legally be done by any notary public. Unfortunately, this is where the legal dispute is concentrated. Malacañang believes there should be a proper, not just acting, chief justice, and Chief Justice Puno seems to agree with this position. Another issue that the forum tacked was whether the president can appoint a chief justice if the JBC refuses to submit a nomination. Here the opinion was unanimous: the constitution states clearly that the JBC has a role in the appointment. The president cannot act without it. If she did, it would damage the standing of the court. The Forum was well attended and extensively covered by the media. It undoubtedly contributed to the debate on the institutional framework and the rule of law of the country. Click here to listen to Fr. Bernas, S.J. 's complete talk.